This is a review of the supplement Solal Brain Booster. This product is made of nutrients that protect brain nerves, as well as improve the levels of brain neurotransmitters. This product mainly improves the levels of acetylcholine and dopamine, the brain transmitters that help people to memorize, focus, concentrate, and improve attention span. You will learn more about this product as you proceed to the following sections. All persons above 16 years should take one capsule twice per day. One container contains 60 capsules meaning that it lasts for a month based on the prescribed dosage. If the purpose is to improve attention span in school-going children at school, it is advisable to take one capsule during breakfast. The second capsule should be taken during late-morning hours with lunch or snacks. Children aged between 10 and 16 years should take one capsule per day with meals or a few minutes after meals. Maximum effectiveness can be achieved by taking the capsules in consecutive cycles of five days and taking a two-day break. The manufacturer warns consumers against surpassing the recommended dose without the help of a medical practitioner. The product can affect persons who are sensitive to the ingredients, as well as those under medication. Users may experience gastrointestinal disturbances, headaches, rashes, increased sweating, sleeping problems, slow heart rate, and anxiety. This product is unsafe for pregnant and breastfeeding women. One container of the product with 60 capsules costs $16. This is the cost a user would incur to use the product for a month. Although this is an affordable price, it is relatively low and may raise concerns about the quality of the ingredients used to make the product. After an extensive research, there was no evidence of a money-back guarantee for this product. The absence of this guarantee may cause potential consumers to question the quality of the product. Nevertheless, there are several positive customer reviews of consumers expressing their satisfaction. Such reviews are a source of attraction to potential buyers who want to test the product despite having no satisfaction guarantee. Solal Brain Booster is a suitable product for people who want their brain nerves protected and brain neurotransmitter levels improved. One of the merits of this product is its strong formulation. The product is made of numerous ingredients that can be trusted. Furthermore, this is an affordable product because of its low price. Moreover, positive product reviews from consumers give potential consumers a reason to purchase the product. However, quality issues may emerge due to the lack of a satisfaction guarantee. This product also has numerous possible side effects, which may cause new users to worry. 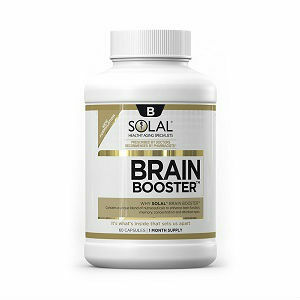 Henry Costa	reviewed Solal Brain Booster	on June 18th	 and gave it a rating of 2.5.